An impressive mixed-use development featuring luxury condos in Metrotown Burnaby is taking shape with an expected presales launch date in Fall 2016! 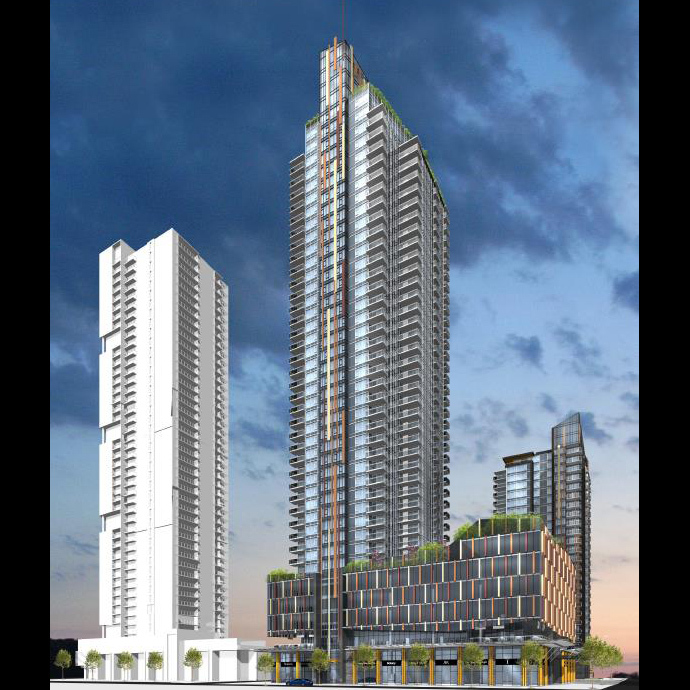 The Metrotown Sun Towers will feature the tallest highrise on Beresford Street and there will be 2 towers at 41 storeys and 26 storeys in height. Brought to you by Belford Properties Sun Towers Burnaby condos will be situated ideally in the centre of town at Beresford Street and Silver Avenue Burnaby BC. Tower 1 at Sun Towers Metrotown presale condos will be forty one storeys tall and will feature 285 condominium residences. The Sun Towers phase 1 high-rise will feature studio, 1, 2 and 3 bedroom floor plans with 4 stunning Sun Towers penthouse suites with roof top patios. All homes will feature air conditioning! Between the 2 high-rises, this masterplanned Sun Towers by Belford Properties will feature 479 market units for presale and they are located across from the newly renovated Metrotown SkyTrain Station and Metrotown/Metropolis entertainment, dining and shopping mecca. As mentioned, this is a bold mixed use project that will also include commercial units on Beresford Street, up to 10,000 square feet of new restaurant space, 70,000 square feet of prime office space in addition to a CEFA day care facility with 6,700 square feet of outdoor play area. This is a very attractive feature for new families no doubt! What sets the new Burnaby Sun Towers Metrotown condos apart from the rest is the largest collection of building amenities in a master planned community. There is a stunning two storey entrance lobby off Beresford Street in addition to a full time concierge. The building will also feature a music room, study room and a lounge with kitchen that has a separate dining room that can seat up to 12 people. There’s also a 6,500 square foot southwest facing outdoor patio with an outdoor kitchen, hammocks, ping-pong table and a fire pit. The Metrotown Sun Towers condos in Burnaby will also have a guest suite for over night guests. The Sun Towers Solaris Club amenity space has a private lobby and concierge and is complimentary for residents. There’s also a swimming pool, fully equipped fitness gym, yoga studio, sauna, steam room, hot tub, badminton court, virtual golf room/simulator and a Solaris Club member’s lounge. As well, the Sun Towers Metrotown condos will feature 29 EV parking spots, a car wash station, 2 bike parking stall per home, 3 car share bays, security with fob controlled lobby, parkade and entry access. All homes come with the 2/5/10 home warranty coverage too. The contemporary homes at Sun Towers by Belford Properties will feature modern kitchen designs with European soft close cabinetry, integrated LED under cabinet lights, sleek and durable polished quartz counters and European inspired chrome faucet. All kitchens feature a stainless steel undermount sink, built in stainless steel microwave and a fully integrated dishwasher. The kitchen appliances depend on the floorplan. The Sun Towers 1 bedroom floor plans feature 24” cooktop, wall oven and integrated fridge/freezer in addition to a 24” glide out hood fan. The 2 bedrooms at Sun Towers Metrotown condos will feature a 30” cooktop, wall oven and integrated fridge/freezer. The 2 bedroom homes over 850 square feet and Sun Towers 3 bedroom condos will feature 30” 4-burner gas cooktop, 30” wall oven, 30” glide out hood fan and double 24” integrated fridge/freezer. The Metrotown presale condos will also feature polished quartz counters and undermount sink in the bathrooms, soft close cabinets from Europe, European inspired chrome fixtures and deep soaker bath tubs. The sparkling bathrooms also feature large format wall and floor tiles, semi-frameless glass doors and low consumption dual flush toilets. Other impressive interior features at Sun Towers by Belford Properties include balconies for every floor plan, 8’ 8” ceiling heights, lush carpets in the bedrooms, elegant wide plank wood laminate floors throughout the living areas and central air conditioning and heating system. Sun Towers Metrotown is the most exciting project to hit this community in 2017! Brought to you by Belford Properties, the high-rise residences will be located at Silver Avenue and Beresford Street Burnaby. 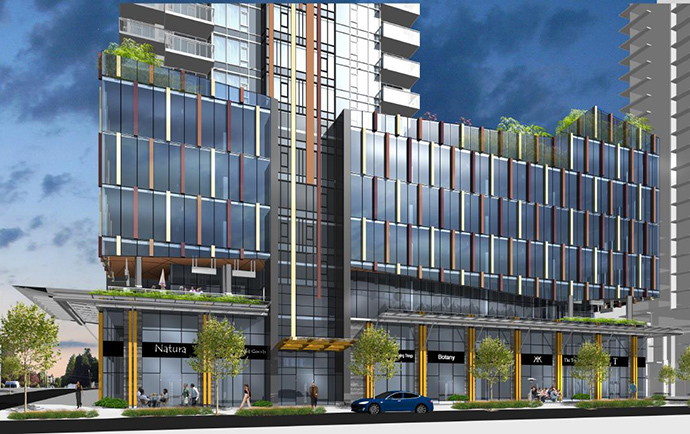 It’s directly across the street from Metrotown Mall and the newly renovated Metrotown SkyTrain Station. There will be 479 richly appointed one, two and three bedroom homes offered in 2 towers at Sun Towers Metrotown condos (41 and 26 storeys in height). The trend setting amenities will include such things as a fitness gym, outdoor entertainment space and much more. There’s also commercial space in the podium deck that will have new retail and office space. At the heart of sought-after Metrotown arises a new epicentre of luxury: Sun Towers. In an unsurpassed location on Beresford Street, soaring higher than any other, this architecturally striking tower provides everything you could want from daily life. Exquisite 1, 2 & 3 bedroom homes with elegant floor plans and sophisticated design exceed expectation. An extensive, 26,000 sq.ft. amenity package features a private club with pool, grand hotel-style lobby, and concierge service for an elevated living experience. Luxurious living – and the world at your fingertips. On a coveted street in the very core of cosmopolitan Metrotown, directly connected to the SkyTrain and downtown, Sun Towers is truly the centre of it all. With immediate access to world-class shopping and restaurants, schools, entertainment and more, the best of life is within reach.